A few months ago Melissa Voigt went to visit the Izannah Walker "Tilly" at the Wisconsin Historical Society. While she was there, she was able to take pictures of the doll there. 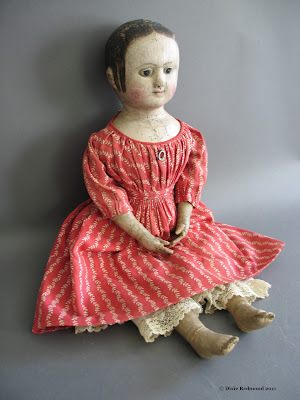 Tilly is object number 1951.1608 in the WHS collection and is described as a "cloth doll, girl, green plaid dress, white apron, USA, Izannah Walker, 1855-1865." Because of Melissa's efforts, and the generosity of the Wisconsin Historial Society, we are able to post pictures of Tilly here on the Izannah Walker Chronicles. Tilly is also featured in the book The Story of My Dolls by Alice Timpet. In her book, Alice Timpet describes her dolls, one of which is named Tillie. 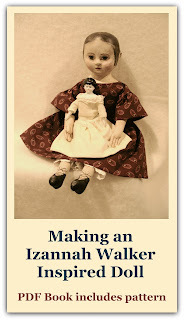 Alice never mentions that Tillie is an Izannah Walker doll, perhaps because she didn't know! Thanks so much to Melissa for taking the pictures, and for getting permission from the Wisconsin Historical Society to post them here. Here she is, holding Tilly. I understand very much the look on her face! has sent a picture of an original Izannah Walker doll! I'll be posting that in a few days. I believe the author's last name is actually "Trimpey"